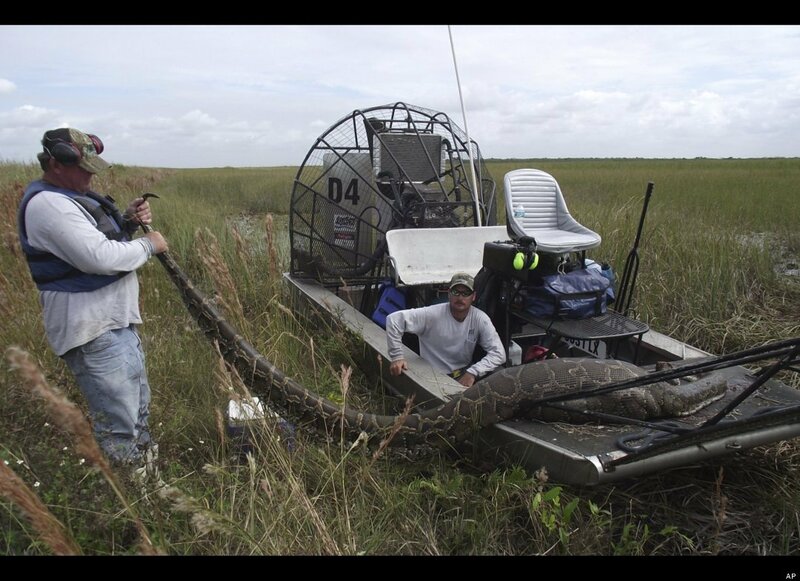 Earlier this month it was reported that officials from the Florida Fish and Wildlife Commission encountered a 16-foot Burmese python in the Everglades (this issue has been previously raised in the Blawg here). Officials felt compelled to kill the snake so to prevent the further re-producing of the species, as well as preventing it from travelling north to more populated areas. Officials report that at the time the snake was caught and killed, it had recently consumed a 76 pound female deer. The Burmese Python is native to Southeast Asia, but according to the University of Florida, the breed of snake has become a popular pet over the years. According to the University, one can purchase the snake for as little as $20.00-$80.00, when it is only a twenty inch hatchling. The problem that this poses is that many purchasers are unaware of the rapid growth. The University reports that the twenty inch hatchling can grow to be eight feet within one year. This leads many owners to simply release them into the wild when they become too big. Once in the wild, the snake reproduces, and the University has reported that their presence poses a risk for the native wildlife and ecosystems in South Florida. It is evident that the issue stems from the inexperience and lack of knowledge of the owners. This past July, a South Florida couple was found guilty in the death of their two year old daughter when their pet Burmese python escaped from its aquarium and asphyxiated the young child. It was also reported that at the time of the attack the snake was underfed and malnourished. Instances like this, as well as the growing Burmese python population in South Florida, demonstrates the lack of knowledge and experience that is present when it comes to the handle and care of these dangerous animals that unqualified and uninformed people keep as pets. What steps should be taken to address this issue? Last summer Florida implemented a ban on importing or acquiring Burmese pythons, as well as a handful of other non-native snake species. Additionally, the Florida Fish and Wildlife Conservation Commission reports that anyone who was in possession of one of these species prior to the implementation of the law, must get a valid “reptile of concern” license. They also point current owners who can no longer maintain their “reptile of concern” to licensed dealers or a Nonnative Pet Amnesty Program event. It is evident that Florida recognizes the issue, and seems to be taking the necessary steps to prevent the problem from growing. I can think of one thing only: regulations are needed to prevent the import and sale of exotic pets. And to maria rosmini’s comment I add: Enforcement of her suggested ban on the import and sale of “exotic pets” is a must. This is a great example of the real threat that invasive species pose not only to biodiversity but in this case, to people as well. Often invasive species, or invasive reptiles in this case, and their impact are difficult to grasp and go relatively unnoticed. The problem conservationists are facing in the Florida Everglades demonstrates just how careful we need to be with exotic ‘pets’. I’m certainly all in favor of restricting exotic pets – But as we know the industry is huge. And smugglers are so very clever in the way the sneak their hostages in… Drugging some and even “wrapping” snakes around their bodies as they board planes. It’s a monumental task to monitor. Somewhere the cure within regulation has to include education to buyers and alternative ways for smugglers to make a decent living. The task is surely overwhelming.